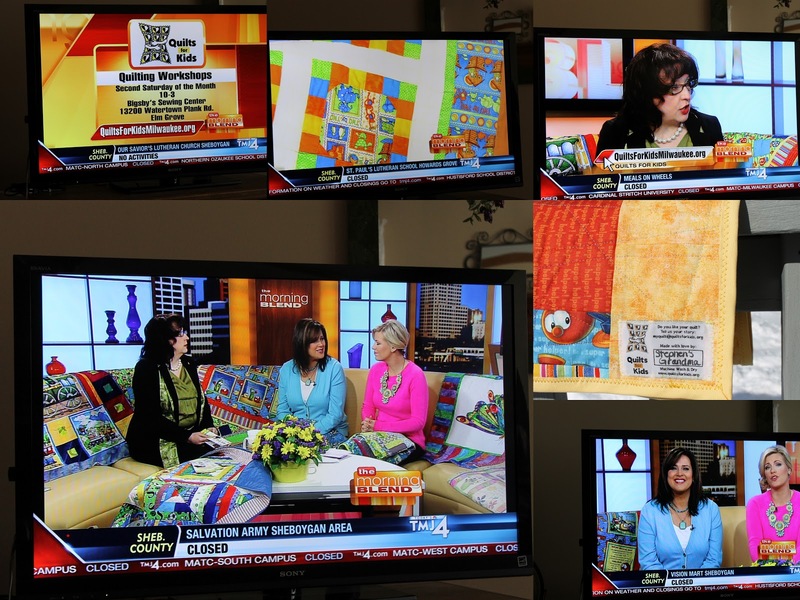 The coordinator of our Quilts for Kids chapter appeared on a local television show this morning. Here is a link to the segment. Here is the completed Valentine's Day Table Runner. It's pretty large for a table runner but that is OK. It will look great on the dining room table. I obviously failed at meeting the Valentine's Day goal for completion, however I can still use it on our anniversary in June. I got the instructions from a blog called Freda's Hive. Here is the link to the free pattern. I had so much fun taking the photograph of it in the snow. In fact, it was still snowing yesterday when I took the picture. Funny thing is that it is still snowing now and it's supposed to continue through tomorrow. 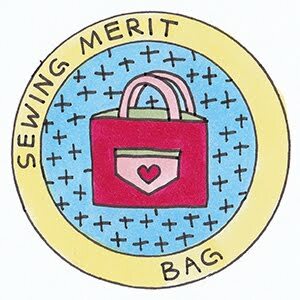 I love being stuck in the house during these winter storms, it means more time to sew! I finished this quilt top in just a few days. I think finishing it had more to do with having to lay out all the squares ahead of time so they don't get mixed up. Part of me wanted the squares sewn together so they were out of the way, and part of me just wanted to see all those bright colors together to make the plus signs. That's a lot of incentive to get it done! 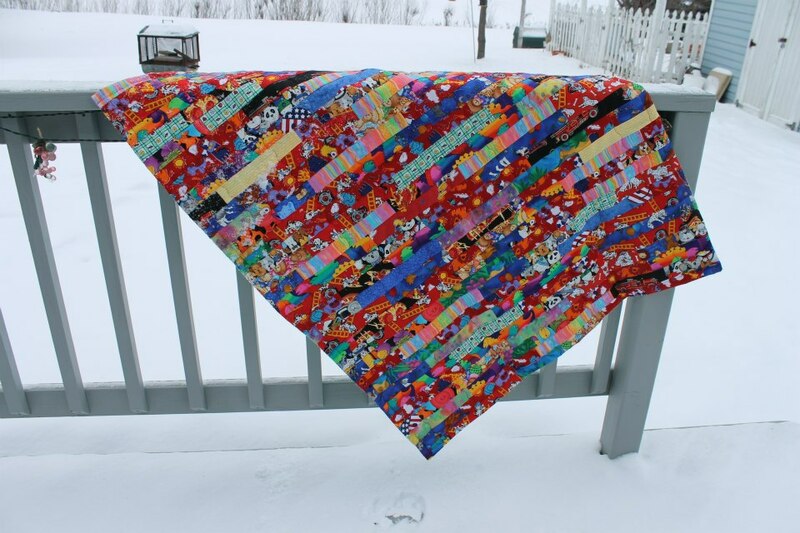 And seeing as looking at snow and normally dreary gray skies is so common these days, the bright colors of this quilt are very refreshing. Luckily, I got a nice sunny day with pretty clear skies when I took this photo. However, it was still pretty cold standing in the snow to take the shot. I used Jeni Baker's tutorial from her blog, In Color Order. You can find that tutorial here. Now I have to decide what to use for the back. I know I want to somehow incorporate all the leftover scraps, so it just might take me a while to work that out. The really fun thing will be deciding how to quilt it. I took some cloth book fabric, cut the book up and made this quilt out of the cloth pages. The hard part was keeping the pages in order so that you could still read the book. After I laid the pages out in order, I discovered that the cover and last page were bigger than the rest of the book. I had to decide whether to cut down the two larger pages or add fabric to the smaller ones. I decided to add extra fabric to even them all out. I think it turned out pretty cute. As usual, I took the leftover fabric and pieced the back together to make a big enough back. This quilt is ready to be sent off to Quilts for Kids. I hope whoever gets it likes it as much as I liked putting it together. 2/26/13 Update: I am so excited! This quilt will be featured on a local television station, WTMJ-4's television show called The Morning Blend tomorrow morning at 9am. So not only will it bring someone a little comfort, it will be a TV star as well. CollectIn Texas Gal's Giveaway - I Won! I won this beautiful bundle of fabric from an adorable blogger over at CollectIn Texas Gal's site. She was generously giving it away as part of the SewCanShe New Years' SewAlong. The colors are beautiful and they are nice and soft and so touchable. I love that about fabric. So thank you so much Sue for sending me this wonderful bundle. I look forward to seeing what you do next! I bought a charm pack of Architextures and a charm pack of solids designed to complement Architextures. Then the fabric store had a 20% off sale on precuts so I bought a jelly roll of it as well. I knew I wanted to make my son a quilt out of this fabric line, but I had no idea what pattern to use. When I finally found a good pattern, I realized I needed more than what was on the jelly roll or in the charm packs. I don't know why I do this to myself...should have never bought the precuts in the first place. I seriously thought I would have the one charm pack around for inspiration then just go buy the yardage but it got way out of control. I hate when I let sales opportunities do that to me. So here we are just making it up as we go. Yesterday morning I took the charm pack of solids and cut them in half. Then I sewed a half square solid to the Architextures charm square. Some of the complementary colors in these solids I did not understand - these colors were really in the fabric line? Whatever. I tend to only use what I absolutely love which is very palate limiting so I just knew I had to trust the charm packs and use all these colors anyway. In the back of my mind I thought I can still get the yardage and start over if I really don't like it. After I ironed them and stacked them neatly, I decided to sew two of these little blocks together (one inverted) to make a funky block. I had to admit, at first I did not like how this was turning out. those solids were taking away from the subtle prints. Then I took the jelly roll and sewed the strips around the funky blocks log cabin style. 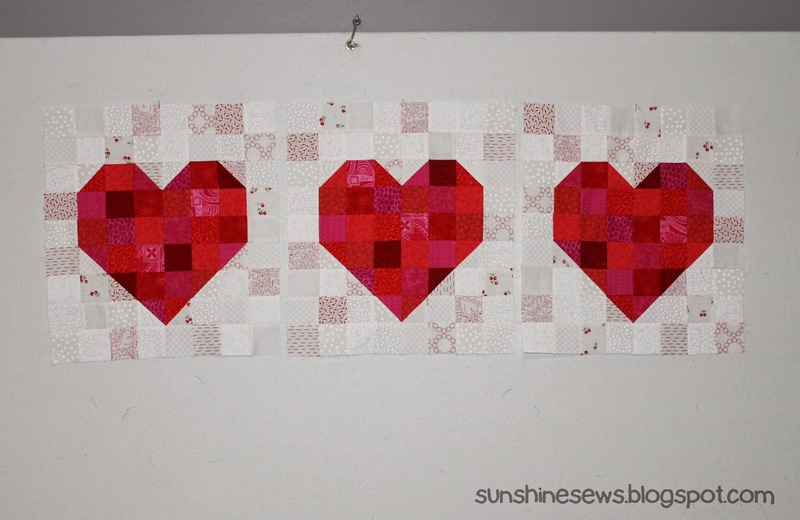 The only rule I followed was to make sure no two fabrics were the same in each block. This really brought out the patterns in the fabric line which made them look much better. Although I was still not so sure I liked it. As I completed each block, I stuck them up on my design wall at random. By the time I got to the last few blocks, it was starting to grow on me. This morning I got up and took a second look at the design wall and I really like the results now. So now I have the dilemma of deciding whether to just sew the blocks together or add sashing in-between. If I add sashing, what color? Arrrgggh! I think I will just sit on this for a few days and hopefully the decision will come to me at some inspirational moment. 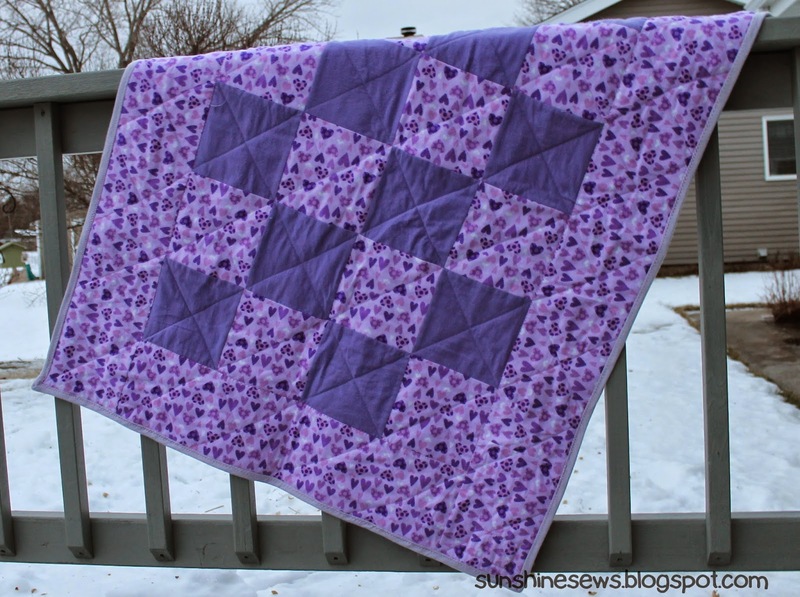 Just in time for Valentine's Day, I finished this purple flannel quilt with alternating squares of flannel purple hearts. It's a nice pre-teen size that is soft and cuddly. 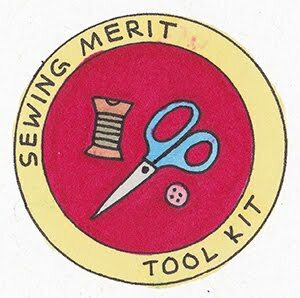 I will donate it to Quilts for Kids at our next meeting. I sure hope it provides some comfort to someone in need. 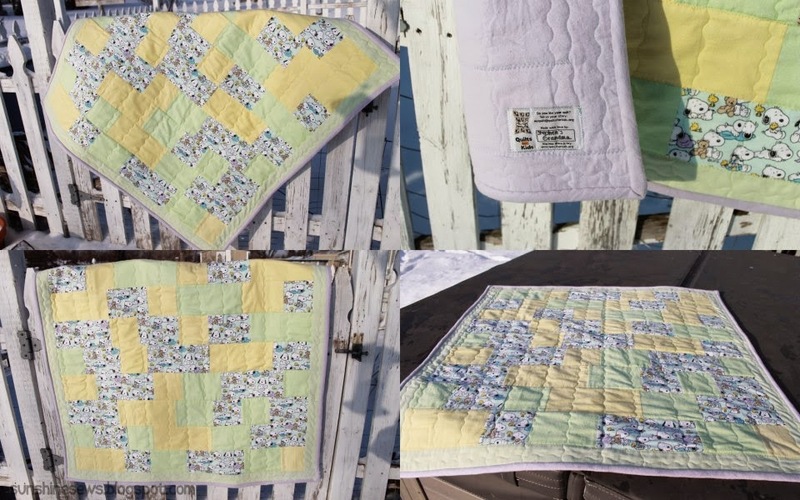 I spent yesterday at Bigsby's with the Quilts For Kids ladies. 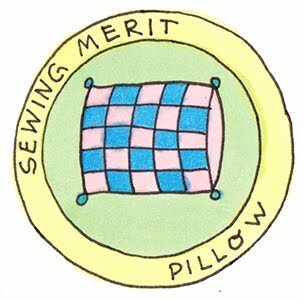 They are a really nice bunch and I enjoy the energy in the room as we sew. The time just flies by and the creativity flows and it makes for a rewarding experience. We did a little show and tell with the finished quilts and I really liked this string quilt (in the photo on the left). It was made with nothing but the scraps that we all were discarding from our projects. I love the way it turned out. In fact, I might have to try to make one myself. I turned in 3 finished quilts. One is pictured here. I think the pink and white with the cute little monkies will be nice for a preteen girl. I hope these kids like them as much as we like making them. 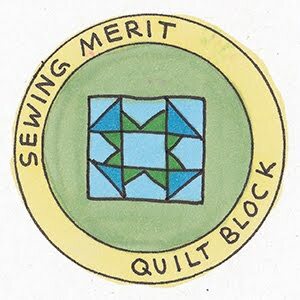 My church group, known as the Sweet Sundays Quilters get together every other Wednesday to make quilts. 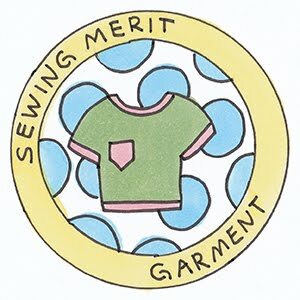 I love the involvement of the non-sewers when it comes to these projects. They are eager and enthusiastic to help and they get very little credit for all the work they do. When the group started, it was all because of a box of fabric that has been sitting at the church for years. No one seemed to know where it came from or why it was there, but it was there. So the ladies got together and sorted the box of fabrics into four categories; manly fabrics, feminine fabrics, kids fabrics and solids. From there we started to make things. Some of the fabrics were mere scraps but we kept them. The leader of our group (who has skills as a sewing instructor) got the ladies to cut the kids scraps into 3-inch strips. She told us it didn't matter how long the pieces were (but obviously the longer the better), just cut the strips. While the non-sewing ladies cut the strips, I stitched them together end-to end, like a mile-long string of a 3-inch strip making sure no two fabric designs were next to each other. After they were sewed end-to end, I cut the strips into 50-inch sections the proceeded to sew those strips together. The funny thing about the strips was that none of them matched by theme or even by color in some instances. I worried about the outcome. At first, I thought this was going to be tedious but I stitched the rows together 2 at a time then joined the sections together after that. It made me feel like I was making real progress sewing the sections together. 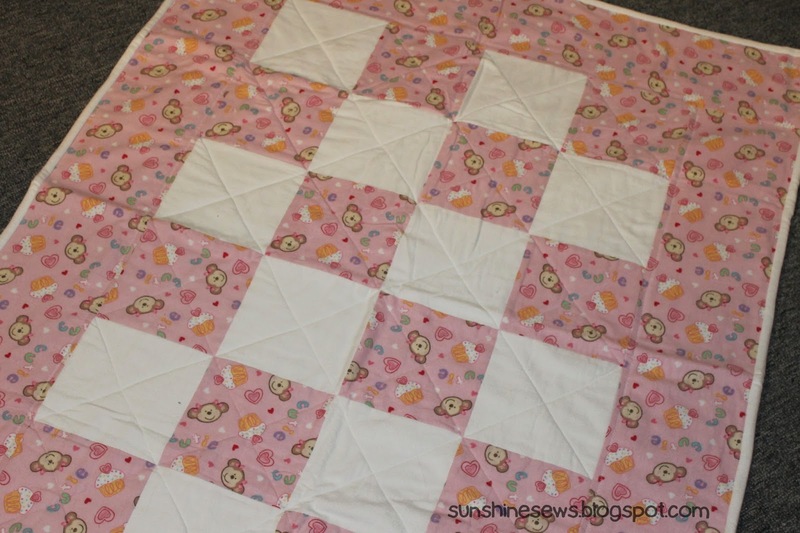 By the time I was done, it felt a little like there was as much thread in this quilt as fabric! In the end, I think the consistency in the primary colors made up for the lack of common themes in the designs. The finished project looks great. I learned a lot about pre-conceived notions regarding color, theme and design by just trusting the process. Now it goes up for auction and I hope whoever owns it likes it as much as I enjoyed putting it together. I finished my first Quilt for Kids quilt. The fabric was from the coordinator's scrap bucket. The colors aren't perfect and the pattern I used required 6 different fabrics but I used just 3. It's supposed to look like mixed sized bricks however with less colors, it just looks like a mish-mosh of stuff. I do wish I could get better shots but the sun seems to be drowning out the colors. It's all flannels and full of cute baby Snoopys so it is nice and soft and cuddly.